Catherine is the Inbound Marketing Specialist here at Vision Advertising. Her work here touches all corners of digital marketing, with an emphasis on inbound marketing practices such as content creation, social media marketing, and more. Not only does Catherine work on all things marketing but she also the supervises our internship program. 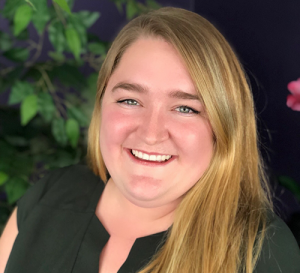 A graduate from Nichols College with a major in marketing and a minor in hospitality, Catherine worked in the marketing field for 4 years prior to Vision, mainly working on content development, editing of blogs, making mean spreadsheets, social media marketing, and a little bit of sales. With all of that, she has a huge passion for creativity, loves to be a team player, and loves to continue her learning. When Catherine is not at work, she is at home spending time with her huge Irish family. If she’s not at home, then she is somewhere hanging out with her friends or hitting golf balls. She enjoys a nice long lazy day where she can indulge in all that Netflix has to offer. She is also a social media feen and loves to post all day long on Snapchat, Instagram, Twitter, and Facebook! Catherine loves to talk, so feel free to say hello!